When all is said and done, there is a lot more said than done! Fake, forgery, reprint.... I suppose intent is what determines what it is. 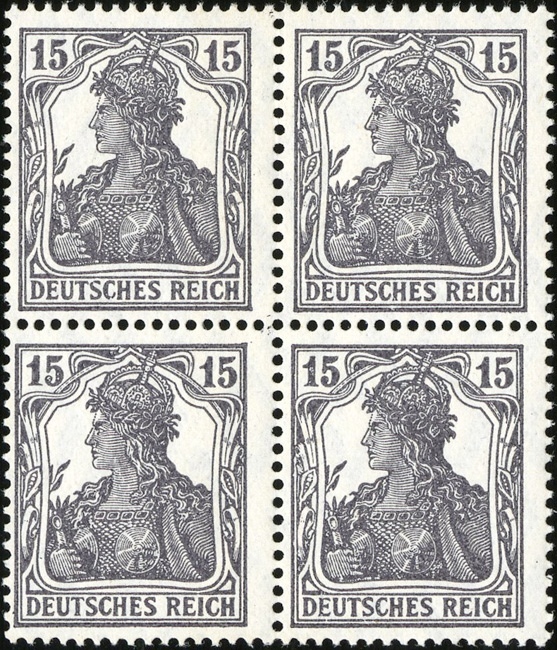 Below are four German stamps from the Germania issues. The top two are genuine. The bottom two are British forgeries. It is my understanding they were printed to facilitate making contact with agents living in Germany by utilizing the German postal system. I have heard there are forgeries from the second world war also. I have heard that the idea was to bomb a train with a postal car, drop a mail bag on the wreckage, and hope the clean up would include the bogus mail bag which would then still be delivered to a postal center and, subsequently, the mail to the agents. If true, sounds like a neat idea. Anyway, the stamps are pretty near identical. I note a slight difference in the perforations and the gum. so how do you tell? i see a slight difference but with out my catalog in hand i would be hard pressed to detect the false one at first glance..
are there any other identifiers? 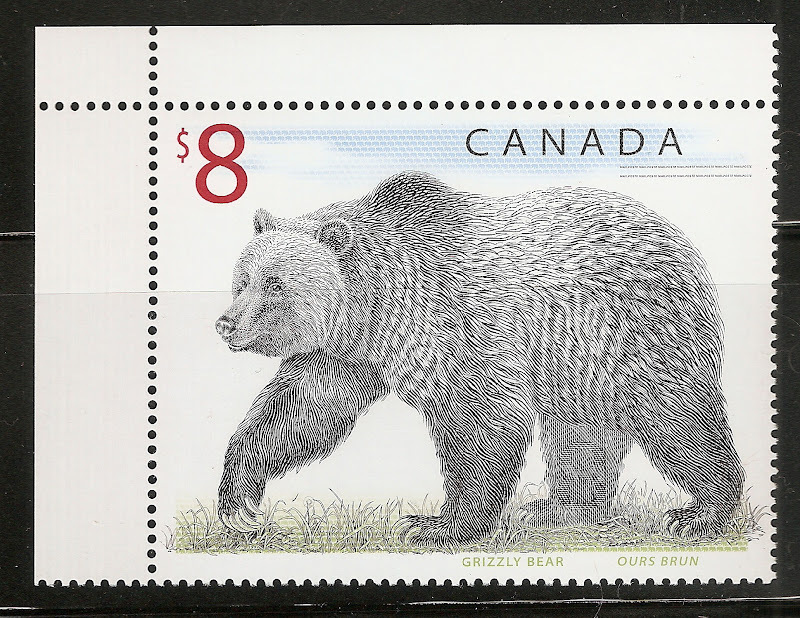 - the genuine stamps had a slight "curl" to the paper. - the forgeries were quite "flat"
- both had watermarks visible to the eye without fluid, while the forgeries were easier to see. - horizontal perforations do not line up between genuine and forged examples. - printing on 15pf cleaner on forgery. - I felt the forged stamps were printed on what felt like "hard" paper. I purchased these from a long time, established dealer who was a member of the German Philatelic Society and so had confidence in the purchase. Absnut- When you say, "horizontal perforations do not line up between genuine and forged examples." Do you mean that the forged stamps have different perfs than what is listed? How common are the forgeries? I have a sneaking suspicion that I may have a couple. The easiest way to ID these is to count the horizontal perf holes. And here they are in blocks of 4. That is great info to know. 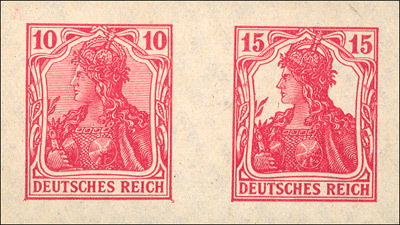 I have a bunch of this Germania issue so off to count perforations. Fascinating and useful information. Thanks! Honestly, before I saw this thread, I didn't realize that these stamps had forgeries. I missed this thread when it first appeared. I don't know much about them and this is a real education. Thanks Absnut. A couple things I do know though I will share. There were several but two notable Forgerers were one from Germany and one from Austria. I think the one from Germany was caught once and prosecuted. Anyway they continued to produce Forgeries. Some of the stamps had Falshe printed on it in very small print only visable with a ten power magnifier or larger and the others had Fascimile printed on them. They produced thousands of these stamps and sold them as genuine. 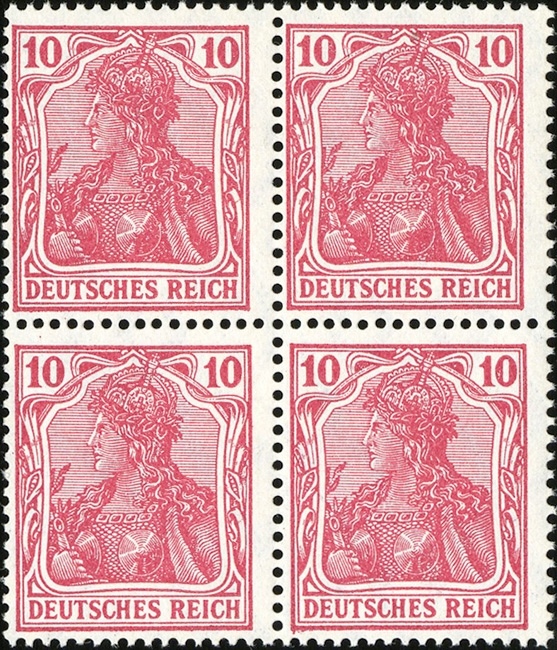 The stamps with Falshe printed on them the print Falshe was right under the number. The stamps printed Fascimile was right where the cancel was placed. They too were printed on it in very small print only visible with a ten power magnifier or larger.I had some and didn't know it. 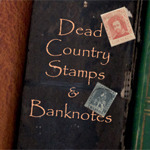 I tried to sell them to Mystic Stamp Company along with some other Revenue stamps. I thought the value according to the U.S. Specialized catalog was around $20,000 Mystic of course rejected them but attached a letter explaining they were forgeries. Sure enough they were. I had a friend a small time APS member and dealer and I talked to him about them. He bought them off me for almost $200. He said though they had no real value. Some collectors and he knew a couple that might be interested. Anyway would buy them to use as fillers. He said though they knew they were not real nobody else would know. So he could probably sell them and make a little profit. So I sold them to him. He wrote out a receipt acknowledging them as forgeries. I signed and he signed and paid me for them. I have wished a couple times I had kept them but. To add to the story above I was going to buy a new car with the $20,000 instead for $200 I would up with a couple tanks of gas for my truck. Ha! I'd like to know more about the forgeries labeled "facsimile". I inherited one of the State Dept. stamps picturing Steward that was alledgedly worth $5000. With a magnifying glass, I noticed the very fine print, "facsimile". This cast considerable doubt on the other stamps in that horde. They are forgeries but since that is put on the stamp. The printers could not be prosecuted. They were Clever, very clever. They are practically worthless.Oh there probably are collectors of those kinds of stamps. You mention WWII in your introduction, I bet the propganda stamps could fill a thread? There were also both postal forgeries and propaganda forgeries in WWII on both sides, most of which are quite valuable. They are very popular and widely collected. Main collecting focus is Germany and all related areas, also casually collecting Scandinavia, Western Europe, Japan and others. What an intriguing post, thank you, very interesting.